Caliph Ibrahim and his caliphate [the Islamic State], if successful, will be seen by Muslims as an act that Allah has willed. If Muslims, particularly Salafi-jihadists, conclude that Allah has willed Caliph Ibrahim’s success, the caliphate will have an immediate gain in momentum. And, group by group, even moderate Muslims all over the world, will be forced to decide whether they will join the jihad because Allah has willed it. Read more. U.S. Central Command said Bahrain, Jordan, Qatar, Saudi Arabia and the United Arab Emirates participated in or supported the strikes against Islamic State targets around the eastern cities of Raqqa, Deir al-Zor, Hasakah and Albu Kamal. … Separately, U.S. forces acting alone launched strikes in another area of Syria against an al Qaeda-linked group, the Nusra Front, to “disrupt imminent attack” against U.S. and Western interests by “seasoned al Qaeda veterans”, CentCom said. Read more. How does Bible prophecy impact what we are seeing on news outlets the world over? How does the success of the Islamic State impact how we interpret the nearness of fulfillment of end-of-days prophecies? Think about it. How does one explain the nations mentioned in Psalm 83, all of which have been at enmity with Israel since the days of Ishmael and Isaac, and none of which join in the attack against Israel in the end-of-days conflict of Ezekiel 38? 1. The neighbors of Israel (in blue) have been subdued by Israel in a previous conflict and at the time of Ezekiel 38’s conflict, they are under Israel’s dominion. This is similar to what happened in the 1967 6-Days War when Israel gained the Palestinian territories and the Sinai Peninsula and the Golan Heights. The problem with this view is that it violates the prophecy of Ezekiel 38 which is specific to Israel and the homeland she has been gathered to. Ezekiel 38:12 is specific as to the target of the attack, “…against the people who are gathered from the nations… who live at the center of the world…” The phrase “center of the world” refers to Jerusalem (Ezekiel 5:5 NASB) and the phrase “gathered from the nations” can only have relevance to the modern-day state of Israel as defined by the 1948 United Nations resolution since this is the land Israel has gathered to. 2. The neighbors of Israel are not enemies of Israel at the time of the Ezekiel 38 conflict but are allies of Israel. Israel and her neighbors have one thing in common – a powerful enemy – the Islamic State. They have joined forces against this enemy. As the saying goes, “The enemy of mine enemy is my friend.” The problem with this view is the same as that of option 1 above — Ezekiel 38 prophesies of gog’s alliance attacking Israel, alone, not Israel and her neighboring nations who have now aligned with her (Ezekiel 38:8 NASB). 3. The neighbors of Israel have been subdued by another group/country prior to the Ezekiel 38 conflict so that at the time of the conflict they have come under the dominion of that other nation/group and the combined forces are are attacking Israel. 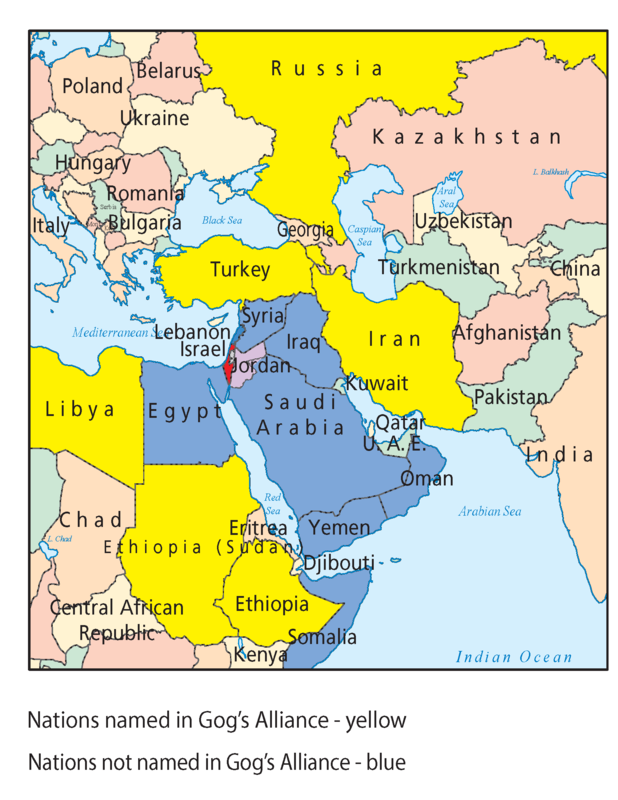 That is, the Islamic State has succeeded in its jihad against these nations neighboring Israel (in blue, above map). The Islamic State then joins with the nations of Ezekiel 38:5-6 so that both groups are aligned against Israel. This interpretation fulfills Revelation 13:7-8 as well as Zechariah 14:2. The only problem with option #3 is its unlikelihood to occur, particularly among the nations of the Middle East as we currently understand their current alignments. For example, how likely is it that Iran (Shia) will ever align with the Islamic State (Sunni-Salifi Islamist), even to wipe Israel off the face of the map? Yet, Scripture does prophesy of just such an “unlikely alliance” in the end-of-days. Revelation 17:11-13 NASB prophesies of a ten member alliance that will put aside their differences in order to be led by the “scarlet beast” in order to fulfill a greater purpose, “to wage war against the Lamb.” (Revelation 17:14, 17 NASB). In addition, Daniel 7:24 prophesies of a ten member alliance that will join for a common purpose – to subdue the world (Daniel 7:23). In the process, three of this ten member alliance are destroyed. What is quite interesting is that the Arab coalition that has been suggested to join America against the Islamic State is a ten member coalition. How long will it take before prophecy is no longer prophecy but history? Only the Lord knows. Matthew 24:36. PreviousIf the United States fails against ISIL, who will stand in the gap? NextEBOLA Estimate in Africa raised to up to 1.4 million by U.S.
Obama is officially leading the ten now. He doesn’t care about our traditional allies, why? As leader of the ten, what does that make him? Don’t overlook this. This is wisdom. Robert. I must confess that is a very interesting point!